A projector is amongst the oldest optical devices in the market that can be used to display and enlarge images or films on a certain surface like a wall or screen. This product has improved a lot since its introduction so that it can stay on par with technology. In fact, most modern models already have speakers of their own. However, when it comes to these projectors, one thing which customers usually associate with them is poor sound quality. Meaning, regardless of their excellent projection capabilities, not many models that can produce a distortion-free sound are available in the market. That is why many people have to connect an external audio source in order to make up for their low sound quality. 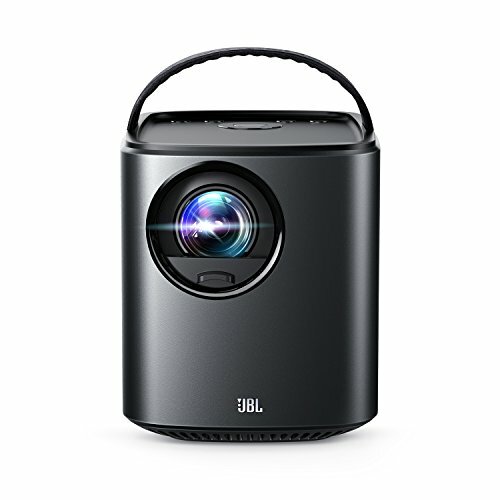 Hence, if you are searching for a projector that can produce high-quality videos without sacrificing the audio quality, the Dashbon Flicks Mobile Cordless Boombox Projector might be the one you need. For you to know more about it, we have reviewed the product below. This white-colored device is capable of projecting videos at 720P resolution because of its hi-fi LED light source. Also present in this product are a couple of full-range drivers along with a subwoofer. Such kind of design ensures that you can use the Dashbon Flicks Mobile Cordless Boombox Projector as a video player and Bluetooth speaker. The Dashbon Flicks Mobile Cordless Boombox Projector has a built-in handle which assists users when it comes to carrying it from one place to the other. Similarly, it only has a listed weight of approximately seven pounds and a size dimension of 11.77 x 6.52 x 5.31 inches. The Dashbon Flicks Mobile Cordless Boombox Projector is integrated with a battery that is rechargeable and has a long runtime. In fact, it can play videos continuously for up to 8 hours on a single charge. This is quite impressive when you compare it with similarly priced projectors in today’s market. On the other hand, if you are going to use it as a Bluetooth speaker, it can keep on playing your favorite music for up to 56 hours without any need of recharging. Which is insane! The Dashbon Flicks Mobile Cordless Boombox Projector is capable of streaming your favorite audio or video in a number of different ways. First of all, you can connect your smartphones wirelessly as it supports Bluetooth 4.0 technology. It also incorporates an extended wireless range, so whether you are sitting five feet or 15 feet away from this device, you’ll always enjoy uninterrupted music. This product can also be operated via a wire since it has a separate HDMI port on its front side. This particular slot comes handy for connecting several streaming devices, including Amazon Fire TV Stick, Google Chromecast, and Roku. Nonetheless, you would need a Wi-Fi connection for this purpose as all these tools cannot work without it. In addition, this product also has a built-in USB port which you can use to charge any of the aforementioned music-streaming gadgets. What is better is that there is also a headphone output which can be used if you want to listen to your favorite music without disturbing your roommates. Finally, an auxiliary input is provided at the front side wherein a 3.5mm jack can be connected. The manufacturer made sure that this product can be used effortlessly by loading it with a number of usable control options. The front dial is the one that will let you zoom the projected videos in and out by simply rotating it in different directions. Whereas, if you want to turn on the projector, a separate button is also available for that, and another button is incorporated for you to be able to go into the Bluetooth speaker mode by just pressing it. The other buttons are intended for adjusting sharpness, volume level, and video contrast. To avoid the hassles of standing up once in a while to operate the product, the manufacturer built a designated remote control that comes with the product upon purchase. You can use it for turning the projector on and switching from projector to the Bluetooth speaker mode and vice versa as well as controlling the HDMI and AUX input. The Dashbon Flicks Mobile Cordless Boombox Projector is a high-quality, portable, and lightweight projector that produces HD videos. You can also use it for streaming your favorite music with the help of Bluetooth technology. In addition, with an integrated USB port, you can also utilize it as a gadget charger. Further, this product incorporates a number of different connectivity options and thanks to the added remote control, you can operate it while sitting on your couch. The Dashbon Flicks Mobile Cordless Boombox Projector can be compared to the Nebula Mars Portable Cinema as it also incorporates built-in speakers and supports HDMI, USB, and Bluetooth connectivities. It is also a lightweight and compact device that can be carried easily as it also has a built-in handle. However, the former device comes with a four-hour battery while the latter offers three hours of play time. Nonetheless, Nebula Mars Portable Cinema is sold at a lower price as compared to that of Dashbon Flicks Mobile Cordless Boombox Projector. The Dashbon Flicks Mobile Cordless Boombox Projector is a product that can be used in your home, office, patio, and backyard as well as something that you can bring in your trips to the beach, mountains, and the likes. 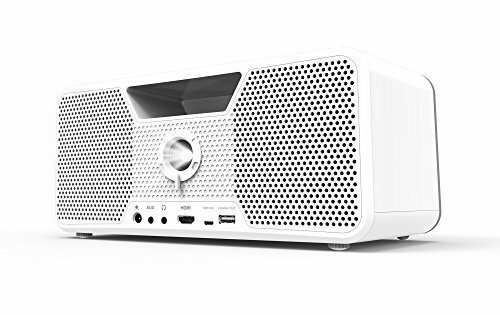 Apart from that, it can be considered as an all-in-one device since it can project premium HD display when used as a projector as well as produce quality audio as a Bluetooth speaker. In addition, as long as you have a power cord, you can charge your USB-enabled gadgets.